It seems to me that there are a great many people who are passionate about playing the cello, but who struggle with the physical size of the instrument . . . more commonly, with the left-hand stretches needed. Some, in their fifties, having played a normal-sized instrument all their lives, suddenly throw in the towel and purchase a seven-eighths size, and presumably live happily ever after. I’ve had increasing numbers of requests for a “lady’s cello”. I dislike the expression; it reeks of sexism and is somehow patronising, as though the players of such instruments are not to be taken too seriously. But that’s ridiculous: there are many very fine players who simply do not have huge hands, and others who are just small. They shouldn’t have the handicap of feeling uncomfortable with their cellos. And yet it is astonishing how few players realise that instruments can, to quite a large extent, be tailored to their needs. A recent client found her ideal instrument, it was perfect in every way except that she found that the string stop – hence the stretches – a little too long for her, and the neck rather too thick. She was amazed to learn that both these things can easily be modified. There are two ways to shorten the (playing) string length: the first is to move the bridge up, with the soundpost en suite. That’ll certainly do the trick, but it’s a rather brutal method. I don’t like to have the bridge moved more than, say, three millimetres on a cello. It looks wrong if the bridge is too high up the table, and anyway the acoustics of a cello are furiously complicated: compromise the bridge position at your peril. Much better is to work on the other end of the string – the tuning-peg end. This does not need an expensive new neck: an extended nut at the top of the fingerboard is all that’s necessary: it’s cheap and effective. A centimetre extra is generally quite enough. It shortens the strings without altering the sounding body of the cello at all. It’s practically invisible yet makes a vast difference to the comfort – and therefore ability – of the player. Of course it’s true that it slightly alters the places where the player expects to find, for example, fourth position, but in practice players very quickly adapt. Such things need to be done thoughtfully. If the string length is much shorter than standard then different tension strings may be necessary, for example. And I know someone who found it painful to play in the high positions, because simply pressing the strings down upon the fingerboard was physically tough for her. Well, fingerboards can be raised, or bridges lowered, just a little, to make things easier. Overdo it, of course, and the strings will rattle against the fingerboard. But a combination of slightly thinning the neck, slightly moving and lowering the bridge, and having an extended nut can transform an uncomfortable brute into something that’s a pleasure to play. Now, for those who just want a physically smaller – yet still full sized – cello, here are some examples in stock at the time of writing. The first is an English cello by Thomas Smith of London, bearing its original label dated 1789. The body is 737 mm, which is a little less than normal, and the string stop, when it has been set up, will be 655 mm: comfy or what? It’s still in the workshop, so I can’t show images just yet. But here are two more. Here’s a fascinating old English cello, circa 1810. It was made rather crudely, and may have been a “church bass”, for such things were common two hundred years ago. It has been thoroughly re-worked now, however, and is perfectly suitable for modern playing. Its body is only 729 mm long (again, about an inch less than standard) but the widths are narrow too. The string length , however, is almost normal at 692 mm. At present it would therefore suit sombody small but with normal-sized hands – but this, as explained above, can so easily be altered. Around 1980 Cyril Jacklin told me he used to take the boat-train to Paris, before the war, to visit Sartory and buy bows directly from him. Eugène Sartory died in 1946, aged seventy-five. He’d worked for Charles Peccatte and Lamy before making on his own account. Cyril was, of course, amazed at the ludicrous prices that Sartory bows were fetching at auction – good ones were then going for over a thousand pounds, whereas only five years earlier they’d been less than £500. During my fourteen years at Sotheby’s I witnessed the inexorable rise in price of Sartory bows, culminating in my very last sale there, which was in June 1991. That was the sale which included five brand new violin bows by Sartory, and another new gold-and-tortoiseshell bow by Émile Français. How so? Well, I don’t think I’m betraying any secrets now if I state that the owners of these bows also possessed a pretty-much unknown, and very fresh, violin by Stradivari, and these bows were just part of their investment. They had never been used and, when I first saw them, were still in the maker’s original box. Astonishing. The Stradivari, incidentally, was unquestionably genuine and had a certificate from the aforementioned Émile Français. Despite quoting an eye-wateringly high, world-record price for the violin, the owners were wise and kept it as an investment. But they were pleased with my estimates for the bows, which by now was over £4,000 each, and they duly arrived in London. There is a superb photograph of five new Sartory bows in the catalogue. One of them, a gold-mounted “Exhibition” violin bow, sold for £15,950. This is over twenty years ago, remember. Why do I mention it now? Because I’ve just got an excellent viola bow by Sartory for sale. Viola bows are pretty rare. Because I keep records of this sort of thing I know that, between 1977 and 1991, Sotheby’s had 125 violin bows, 41 cello bows and only 11 viola bows by Sartory. This is a nice straightforward example, stamped in the right place and under the lapping as well, and with a completely un-interfered-with head. It weighs 72 grams. I went to a performance at the English National Opera last weekend. Above the safety curtain, and part of the permanent structure of the place, is a large sign which says COLISEVM. And it set me to thinking about the use of V instead of U.
Stradivari, famously, did it the opposite way round: the vast majority of his labels say Stradiuarius; only after 1730 do they use a “v” instead of a “u”. And the Hills noted that there are some genuine labels which spell the Christian name Antonins instead of Antonius. This is a further complication, the use of the letter “n” instead of “u”. The Hills explained this by suggesting that, with old-fashioned moveable type, the type-setter had simply got the letter upside-down. 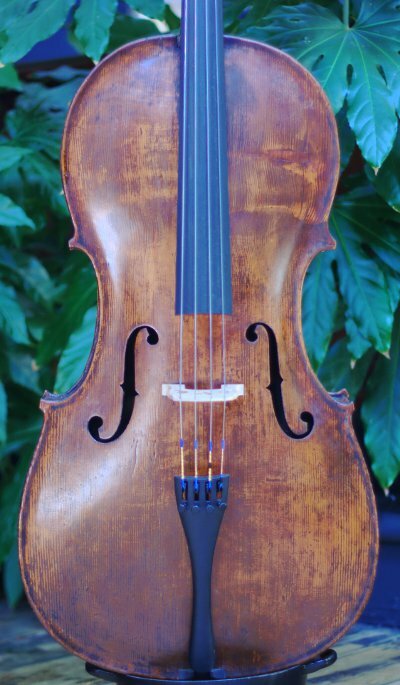 The reason I mention it now is because I have a violin in stock made by Carlo Taneggia, for so he is recorded by Carlo Chiesa, and Chiesa is a very considerable scholar. However I know of a Milanese violin made in 1731 in absolutely original state, still with its original stained fruitwood fingerboard, tailpiece and three of its pegs. I found it for Sotheby’s in 1990, and it was Lot 197 of their sale that year. The label inside is unquestionably genuine, and reads Carolus Antonius Tauegia fecit in Via Lata Mediolani Anno 1731. That’s TAUEGIA. I’m not fussed about whether he uses the letter “g” once or twice, by the way – Shakespeare spelt his name several different ways, and Francesco Rugeri also used different spellings. But the u/v thing is interesting. I had thought that the very clear “u” in the label mentioned was actually a “v”, and I catalogued the violin as by Tavegia. I suppose Chiesa, who has more information than I, reckons it’s an “n”. Tavegia/Taneggia was a primarily a bucket maker, resident in Contrada Larga (the violin-maker’s street) in Milan. According to Chiesa he lived there all his life, so Via Lata in 1731 really is new information. It shouldn’t really matter, for Taneggia was definitely not a gifted maker. Neither were any of the Testore family, though. The snag is that they sound good, and, being Italian and of a certain age, are today very expensive. My violin has been dendrochronologically tested, and the wood dates from around 1710. That fits nicely with Tavegia’s dates of 1681 – c1745. It is undergoing restoration as I write this, so I don’t know how it will turn out or how much I’m going to ask for it at this stage. Somebody recently asked me for a 5/8 size violin – which I don’t possess – and it set me to thinking about the sizeist bullying that many players are subject to. There really shouldn’t be any hard and fast rules about sizes. Play what’s comfortable and you’ll play better. I know of a professional violinist in a major orchestra who uses a viola bow – he says he gets a more powerful tone as a result. And I know of the opposite, a viola player who uses a violin bow – she says she finds it less tiring. Who am I to disagree? Nobody notices unless it’s pointed out to them. So this 5/8 size violin . . . no, a ½ size or a ¾ size wouldn’t do: it had to be exactly right for the child. And yet young piano players don’t get half-size or whatever pianos to learn on; they just have to get on with it. If they can’t reach, well, they play something that doesn’t demand such big hands. It used to be the same for violinists, too, for most of the 18th and 19th century virtuosi learnt their craft on full-sized violins. Child’s violins are largely an invention of the early 20th Century – this is quite different from the small-sized violin called the violino piccolo used by Bach, for example in the first Brandenberg concerto. With violas the problem continues into adulthood. There’s a school of thought which says you can’t be serious about playing the viola unless you have an instrument of at least 16 in. (or 40cm.) body length. And yet I’ve sold three excellent small English violas, by Forster, Banks and Kennedy, to satisfied but surprised clients. All of them shared the common difficulty of finding some of the left-hand stretches uncomfortable, and all wanted a small instrument that sounded good. Their surprise stemmed from the fact that the instruments sounded so good. Violas are, by their very nature, compromise instruments. In the seventeenth century there were two types of different sizes; altos (about 15 in.) and tenors (perhaps 17in. ): today’s 16in instrument lies somewhere between the two. Here are a few commonsense facts about small violas. 1) They are normally more powerful than larger instruments. Think. Small violins, like those by Guarneri, tend to be even more powerful than normal-sized ones by Stradivari. Violins are just as loud as cellos, and louder than double basses. Acoustic volume is not dependent upon physical volume. A tiny shepherd’s shawm, with a similar reed to that of an oboe or a bassoon, is far louder than either of these. 2) This is still true for the lowest string, the C string. All else being equal, the C string of a small viola is, actually, louder than that of a large viola. That’s the big surprise. 3) Of course a smaller viola will sound less like a cello than a bigger one. That’s the inevitable consequence. But it’ll still sound different from a violin, and be able to play the viola repertoire. Now I’ve got a yet another small English viola. It’s by Bernhard Simon Fendt, made between 1798 and 1809. Its body is 15 3/16 in. (385mm.) long, with a string length of 13 7/8 in. (351mm.). It has, in common with most instruments made by Fendt, a one-piece table with wide, not particularly straight grain on the bass side. It’s in excellent condition, and still retains a one-piece bottom rib. It’s going to sound wonderful. Actually the label’s not like this: it’s impossible to photograph and this is the best I could do. The real label has a large image of a bass with its bow in the middle. Purely coincidentally, just now I have a violin and a cello by B.S. Fendt for sale as well. How the violin trade works. Little is known about the Tyrolese maker, Mathias Alban of Bozen. That’s Tyrolese, not Italian. It is not known who taught him – there have been several guesses – but sometimes his varnish suggests that he might have been trained in Italy. Before World War I, the Italian town of Bolzano was part of the Austro-Hungarian country of Tyrol. It was called Bozen. The population spoke German. Bozen did not become Italian until 1919, when it was annexed by Italy at the end of the first World War. At the time of its annexation Bozen had a population of 30,000 German-speaking people. In the 1920s the city, along with the rest of the province, was subjected to an intensive Italianization programme under orders from the fascist government of Benito Mussolini. The German language was banished from public service, German teaching was officially forbidden and German newspapers were censored with the exception of the fascist Alpenzeitung. The regime massively favoured immigration from other Italian regions. The aim was to outnumber the local German-speaking population by tripling the population with Italian-speaking immigrants drawn from the old provinces. He is considered (in older textbooks) to be second only to Stainer in importance in the Tyrolese school of lutherie. Fridolin Hamma, as recently as 1948 , included Mathias Alban in his book on German violin makers. Italian violins, though, are far easier to sell, and far more expensive than Tyrolese examples. Since the early 19th Century, therefore, Alban’s original labels have been removed and fake labels, in Latin, have been inserted. By 1850 most books about violins refer to him as “Matthias Albani” – a rather curious mixture of Germanic given name and Italian surname. And since 1919 frankly Italian labels have been put in. This accounts for the astonishing variety of labels illustrated in the textbooks – at least a dozen different examples are illustrated in the common dictionaries of violin makers, and I found nine more in old auction catalogues. All these labels are completely different – some are printed, some are written in ink. Those that are printed have completely different fonts. Those that are written have completely different handwriting. They’re all fake, of course. Genuine labels from this maker might well have been in German, in common with the labels of most other contemporary German-speaking makers, and less likely to have been in Latin. I can remember selling a violin which was considered to be by this maker at auction, and which was described as Tyrolese. It had a label inside: Matthias Alban, geigenmacher in Bozen. I saw it again a few months after the sale, now described as an Italian violin, and with a label which read Matteo Albani fece in Bolzano. Now that’s just silly. Category: cello, viola, Violin | Comments Off on How the violin trade works. This is a high-tech treat. 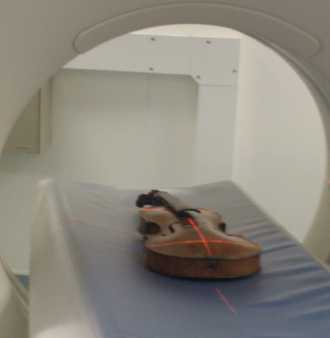 What you’re looking at is a CT scan of a violin by Nicolo Gagliano, circa 1750. I sold it recently, but not before it had been given the most careful condition report imaginable. There was a little squiggly mark in the lower back, and internally there was a large patch covering roughly half the lower bouts, going from side to side. The worry was whether it was woodworm damage. I thought that it probably was, but still nothing to worry about. Woodworm dislike the light, and tend to burrow within the thickness of the back (only occasionally the front: I suppose maple tastes better). So the characteristic little hole that is seen usually means that the wood is hollow underneath, sometimes for several inches up and down the grain. But here the burrow, if that’s what it was, was across the grain and about half an inch of it was visible. 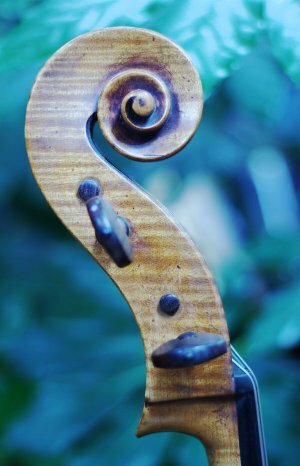 Now, if the woodworm had attacked the wood before it was fashioned into a violin back, that’s understandable: once inside a nice thick chunk of wood the worm can turn any which way, and so the finished instrument might have random, though seldom significant, worm damage. By the way, it is not too uncommon for old-master makers to use wormy wood – Stradivari did, in 1707. I’ve seen three different Strads of this date, all of which used glamorous, though damaged, wood. Stradivari’s original repairs, underneath the varnish, are clearly visible. Back to the Gagliano. 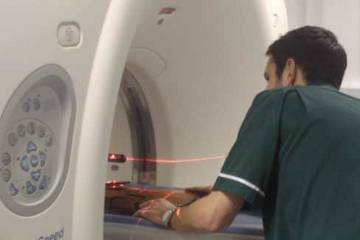 First it was radiographed (X-rayed), which seems positively old-hat these days. It showed nothing significant. Have another look at the CT scan. It starts with the bottom block and slides up, past the soundholes and soundpost; the corner blocks are evident, then, above, the fingerboard suddenly appears. Be patient as it passes up the neck, because the pegbox and the pegs show very well. Look at the detail: the holes for the strings are clearly visible within the shafts of the pegs . . . and that’s what we wanted, really, because these holes are much the same size as a woodworm run, and, as you can see, there aren’t any runs in the back of the violin. If you look carefully you can just make out the patch I mentioned, halfway up the lower bouts. Surprisingly, it’s not visible at all in the X-ray image. You have to have friends in pretty high places to do this: the equipment costs the thick end of a million and the expertise to use it isn’t cheap either. So therefore huge thanks to Highcroft Veterinary Hospital and to Nic Hayward from Veterinary Diagnostics for doing it as a favour. Here are a few quirky things. 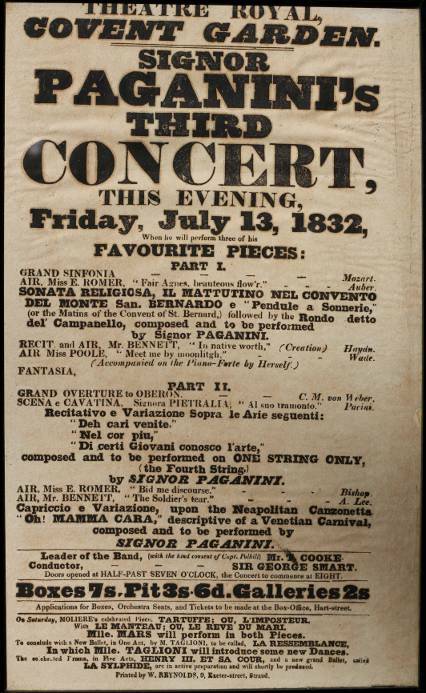 The first is a poster for one of Paganini’s concerts in London. It’s fascinating on various levels. Paganini was a superstar by 1832, and his concerts were invariably sold out. Such was his skill that it was said he was in league with the devil – and some of the more gullible even claimed to have smelt sulphur during his performances. Look how the concerts were mixed up – a Mozart sinfonia, a Weber overture and plenty of singing as well as regular fireworks by Paganini. One of his sets is to be played on one string only. This particular poster is framed, and stuck on the back is a nice letter from Arthur Hill (of W.E. Hill & Sons) dated 3rd May, 1935. I bought this poster in a general auction, and it was accompanied by a beautiful trade card from John Betts, the Real Musical Instrument Maker. This latter dates from circa 1800. Now here are some beautiful oak violin cases. Heavy and easily scratched – impractical, of course, and I seem to accumulate them faster than I can sell them. Old cases can be very interesting, though – I have one made for Charles Brugère, with his name nicely engraved in italic on the lock, for example, and another sold by Auguste Sebastien Philippe Bernardel. Mahogany cases (again, I have too many) tend to be older, but one in particular interests me, because it certainly dates from 1813. This I know because it exactly fits the outline of the 15 3/16in. viola by Thomas Kennedy that I bought recently. I was delighted that it came in its original case. Incidentally, the viola is clearly inscribed on the inside of both the front and the back: Thos. Kennedy, Maker, 16, Wellington Street, Middlesex Hospital, London, 1813. The address is interesting, for at that date Kennedy was working at 16, Nassau Street, Middlesex Hospital. I conjecture that the name was briefly changed to that of the hero of the day – Wellington’s spectacular victories in Spain date from 1810 (Bucasso), 1812 (Salamanca) and two in 1813 (Vitoria and Nivelle). Oh, look at this. I’ve often seen tiny miniature model violins, but never this good. The miniature brass mute and an ordinary full sized one. I haven’t cheated; that’s not a viola mute. The case is a perfect copy, the bow tightens up as it should, the pegs turn, there’s a soundpost and a bassbar inside . . . even a miniature box of rosin and a tiny violin mute, all to scale. Unbelievably, the purfling is inlaid – though one needs a powerful lens to see it. 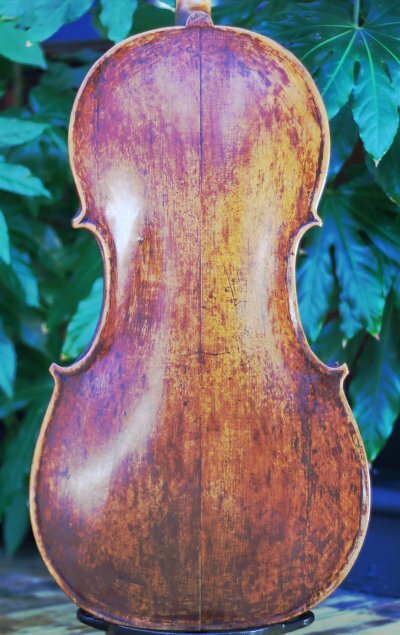 This violin was catalogued in a specialised violin auction (Gardiner Houlgate, March 2011) as “Late 19th Century . . . ” with no further attempt to narrow down the attribution. It was estimated at £100/150 and was in a very neglected state. I was pleased to get it for £448.40p. It ‘s much earlier than that. There’s a good graft joining the new neck to the pegbox, and every detail screams mid 18th Century. The utterly extraordinary soundholes are unforgettable, which is why I remembered the same ones in Millant’s book about Vuillaume – plate 3 shows the table of a violin by the famous Jean-Baptiste’s great-grandfather – Claude Francois Vuillaume. There were apparently no less than four members of the family called Claude Francois during several generations. The one in question, the second of that name, was working between 1730 and 1770. Here’s how it looked when I got it home – absolutely filthy. This is just a snapshot – but I’ve bought a new camera and I’ll do a far better image when it has been restored. Now, I remember having doubts about Millant’s plate 3. The violin shown there has a Vuillaume brand, but is such an exaggerated Stainer-type thing that I wondered if it might not be from Mittenwald, say, and merely have a fake brand? But Millant states that these violins are invariably oversized – which would be unusual for Bavaria, and more normal for Mirecourt at this time. I never expected to see one, but in in the spring of 1987 one turned up at Sotheby’s, and it became Lot 157 in our sale of the 30th April. In those days we only illustrated the backs of the less-expensive instruments, but even so one can recognise the dark brown varnish (again, like Bavaria) and the very short corners. Also that one was identically oversized, like my one (both 36.3 cm. ), and that one had the same curiously-positioned very large pins in the back – to the right of the end-pin and to the left of the button, both being well inboard of the purfling. In the workshop, with the table off, we noticed that the linings extend both over and into the corner blocks, and that the centre bout ribs are butted up against the top and bottom ribs, giving the impression of pushing the corners out, rather than being mitred together at the corners. All this is very French. Millant must have been correct. Millant’s example only shows the table, but the one in the 1987 sale shows the whole back, including the scroll. Mine, though, has a carefully carved animal’s head. God knows what it’s supposed to be – in could be a lion, but Gardiner Houlgate had it as a griffin. (A griffin should have a bird’s beak, though: this doesn’t. Forgive the pedantry.) Whatever, it isn’t quite the same as the usual Bavarian carving – it’s rather better. Also this example has curious slab-cut wood for the back and ribs. I suppose one could call it bird’s-eye maple, but in truth it hasn’t the usual small knots that one expects – rather it’s burr maple, and maybe from the root. The single piece isn’t big enough for the whole back, and the lower bouts have wings on both sides, and the upper treble bout also has an extra slice. All wings are original, and the maker’s studs joining the pieces are visible through the soundholes. At first I thought to have it restored in baroque condition, then I thought to leave it alone – after all, the (modern) neck is perfectly sound . . . but now I’ve decided to get it back into its original state, after all. It’s so unusual and odd – it’d be a shame to try to make it more conventional. I’ve just got some fascinating bows for sale. Principal among them is a beautiful silver-mounted violin bow by the legendary William Charles Retford. It has a really good octagonal stick, and weighs 62 grams. It is accompanied by no less than thirteen letters by him to the original buyer, a Mr. Atkinson, who was an enthusiastic collector of bows. The letters are all from 107, Grove Avenue, Hanwell – the address of Sydney Yeoman’s son, Jack, and his wife Monica. It was just across the railway and a few hundred yards from the Hills’ workshop. Sydney Yeoman had been a bowmaker for the Hills for six years before Retford joined the company, and the two were lifelong friends. Sadly Yeoman’s health was permanently ruined during the great war. He died in 1948, and his son and daughter-in-law lived there afterwards. In old age, Retford moved in with them and they looked after him. Retford’s son, William Richard (also a bowmaker) had died in a car accident in 1960, and his wife was also dead. The letters are very chatty and usually mention the English obsession with the weather and the garden, and the writer’s state of health and so on, and his small holidays in Bournemouth. However there is a lot to fascinate those interested in bows. “I have been asked to make two elaborate gold and tortoiseshell bows. I don’t see much prospect of this. It’s a job for a younger man under ideal conditions. I can still do young man’s work . . .
“Young folk don’t worry me much. My people are not near my [age] but I never grew up. We old people have fixed habits and don’t like them disturbed. Young people can’t understand that. We are alone. Monica and Jack look after me well . . . they are very unselfish. About 60. ” . . . several queries you have asked – a cello bow stamped “Hoyer”. They are a German family of makers, mainly of the cheaper type. They are usually German-silver mounted, but the sticks would be good. Few good makers used German-silver on cheap work. I have seen some by Thomassin, Paris. They would be classed as student bows . . . There is an American Dictionary that gives names of continental makers, also the English. The information [on] the English makers is very inaccurate, so the continentals may be the same. The title is Bows for Musical Instruments by Joseph Roda. It costs about £7. I wouldn’t expect it to be otherwise. It is full of photographs of bows. “I wish you good luck for your proposed exhibition . . . insurance is important. Bultitude had 2 gold bows on show in London. They were stolen. William Charles Retford died on the 17th September 1970, aged ninety-five. He had been with the Hill’s for sixty-five years, and had retired in 1956, aged eighty-one. There is another letter addressed to Mr. Atkinson from the same address dated July 6th 1973. This is from Jack Yeoman, who had been caring for the old man. Finally there is an interesting, undated Christmas card from Jack Yeoman to Mr. Atkinson, referring to another bow in the same collection – a silver and tortoiseshell-mounted W.E. Hill & Sons violin bow, with the full stamp. This weighs 63 grams. “So pleased to hear you have acquired one of my father’s bows. I hope it was one he made prior to the 1914-18 war. As you may know he was badly shell shocked at the Battle of Arras. Other bows in the collection include a silver-mounted violin bow by Percival Wilfred Bryant, the frog of which has his characteristic chamfered heel. I’ve no way of dating it – but it’s probably from the mid 1960’s, when the collection seems to have been assembled. It’s in very good condition. This also weighs 63 grams. There’s a French silver-mounted violin bow by Charles Bazin, a very typical example dating, probably from around the turn of the century, weighing 59 grams, and an excellent viola bow – 65 grams. This latter is unstamped, and is the only bow that is not in perfect condition, having a few scratches in the stick above the frog. I’m not clever enough to identify the maker. It has a good strong octagonal stick, the bottom plate is screwed, not pinned, to the frog and it has clearly visible slide grooves in the heel – very French. I spent the first three days of this week in London. There were five violin auctions there within that period, and I managed to view three of them. I suppose I could have managed all five, but it’s quite tiring. I should add that I had visited Sotheby’s and Bonham’s two weeks earlier to examine those instruments that particularly interested me. I remember the late Bob Lewin’s articles after the big auctions in London, noting trends and recording particularly unexpected prices. I could do something similar, but this information is available elsewhere, so here’s an alternative and very opinionated sale report. 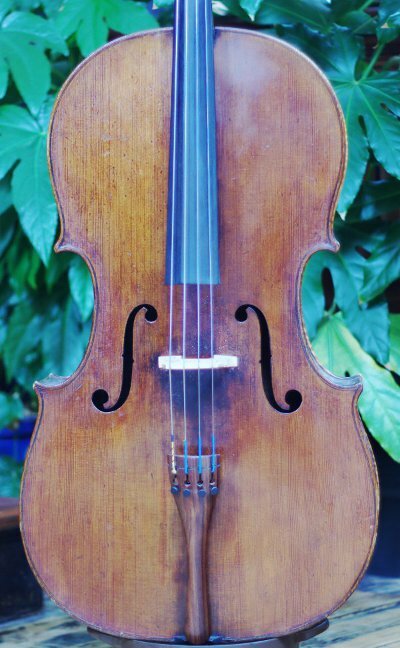 In the Sotheby’s catalogue (Lot 62) I was amused to see a viola correctly described as by George Wulme Hudson, labelled, as his instruments so often are, with a completely fictitious Italian-sounding name – in this case J. Galiendo of Turin. Wulme Hudson instruments are sometimes very recognisable, having backs made of a particular piece of slab-cut maple which Cyril Jacklin had sold to him. This was one such. Wulme Hudson was not a complete faker, though, and it’s unlikely that he sold this instrument as anything other than his own work – and anyway he generally branded his work on the top block, as indeed he did in this case: it’s clearly stamped George W. Hudson. And yet this instrument had a certificate from no less an authority than W.E. Hill & Sons, dated 27th April 1960, ascribing the instrument to . . . yes, you’ve guessed it . . . J. Galiendo of Turin. Once again I marvel at the folly of those who write certificates for things they know absolutely nothing about. I mean, anybody can make a mistake – but a certificate? In the Bonham’s catalogue was a violin (Lot 40) with a recent certificate from an American dealer, P.P. Prier of Salt Lake City, dated 17th May 2005, which stated that it was made by Carlo Tononi, circa 1720. Wow. An important violin, then. Except it wasn’t. I think the Bonham’s catalogue got it about right with their description “circa 1750, Tyrol School”. Now, I wonder if the author of the certificate feels humiliated by this? Or if he feels that Bonham’s are wrong? Or if he doesn’t care about the very big difference in attribution? For myself, I’d curl up with embarrassment if my opinion and reputation were so publicly questioned. I have very thin skin, I suppose. What else? 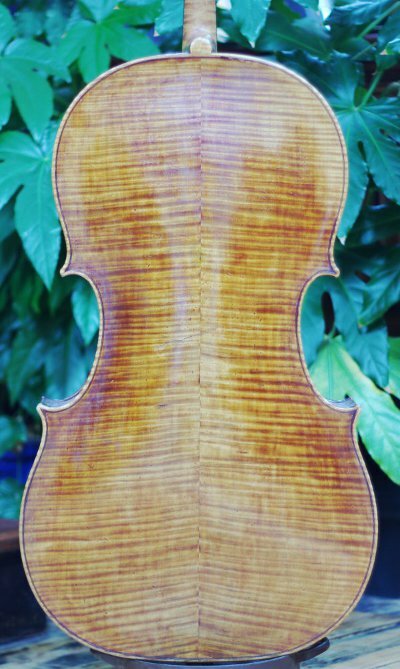 The magnificent and beautiful violin by Stainer, the very one in the Hottinger book, sold for a hammer price of £170,000 – but the price recorded on their website is £205,250. More than 20% extra. This was above Sotheby’s printed estimate, but even so, it seems very good value. 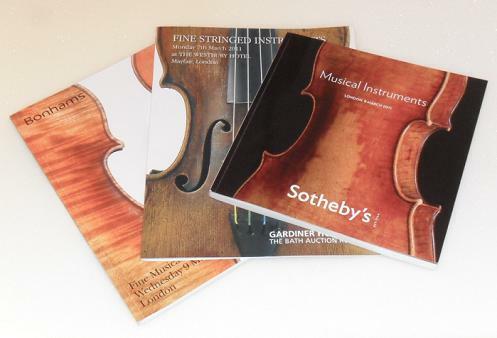 Over twenty years ago a wonderful and original Stainer violin sold for over £70,000, and in that time prices for the very best stringed instruments have increased, what? tenfold? Something like that, in the case of instruments by Stradivari and Guadagnini. Oh, and despair, all you players who want a Sartory bow. Bonham’s had a wonderful selection of bows, among which were three really good, clean and straightforward examples: Lot 89, a silver-mounted violin bow – £19,200, and lot 91, another silver-mounted one at £18,000. Lot 92 was a silver-mounted cello bow – £20,400. Now, these were very good bows, but not Sartory’s highest specification gold or tortoiseshell-mounted work, which presumably would be even more. Bearing in mind that I saw only dealers at these sales, I wonder how much more will be asked later on? As always, some undistinguished instruments seemed to go for inexplicably high prices, and others with apparently everything to commend them flopped. Auctions are strange. A friend reminded me of one time I was in the rostrom at Sotheby’s, over twenty years ago. I’d forgotten, but apparently I’d conducted the sale not in pounds or dollars, but in sponduliks . . . I guess I really was too flippant for such an establishment.